Detail of A Map of Philadelphia and Parts Adjacent, depicting the State House as it appeared in 1752. The image shows the original bell tower, which lacked a clock. Independence Hall in ১৭৯৯, with the wooden steeple removed and Thomas Stretch's clock (far left). The Liberty Bell (foreground) was housed in the highest chamber of the brick tower. The Centennial Bell (top) hangs in the cupola of William Strickland's 1828 wooden steeple. A National Park Service Ranger describes Independence Hall's Assembly Room, in which both the Declaration of Independence and Constitution were drafted and signed. লিঙ্কন এর অন্ত্যেষ্টিক্রিয়া ট্রেন ("লিঙ্কন স্পেশাল") শনিবার হ্যারিসবুর্গকে ২২ এপ্রিল, ১৮৬৫ এ ১১:১৫ এ পৌঁছে এবং ব্রড স্ট্রিটে স্টেডিয়ামে ফিলাডেলফিয়া পৌঁছায়। এটি 85,000 জন মানুষের একটি ভিড় অতীতের দ্বারা বহন করে এবং স্বাধীনতা হল এর পূর্ব বিভাগে বিধানসভা রুম রাজ্যে অনুষ্ঠিত হয়। সেখানে সেখানে ২৭ জন নৌ ও সামরিক কর্মকর্তাদের বিস্তারিত বিবরণ দেওয়া হয়েছিল এবং নিরাপদে রাখা হয়েছিল।  সেই সন্ধ্যায়, শোককারীদের সম্মানিত অতিথিদের জন্য একটি প্রাইভেট ভিউ ব্যবস্থা করা হয়েছিল। পরের দিন (রবিবার - এপ্রিল 23, 1865) লাইন 5:00 এ শুরু শুরু। ৩০০,০০০ এর বেশি শোক প্রকাশকারীরা শরীর দেখেন - কিছুক্ষণ অপেক্ষা করে তাকে দেখার জন্য 5 ঘন্টা। লিঙ্কন স্পেশাল নিউ ইয়র্ক সিটির জন্য ফিলাডেলফিয়া এর কেনসিংটন স্টেশন পরের দিন সকালে (সোমবার - এপ্রিল ২৪, ১৮৬৫) 4:00 এ.এম. 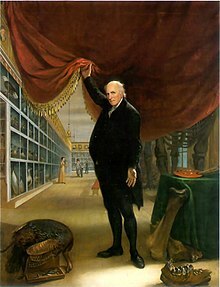 The Artist in His Museum, an 1822 self-portrait by Charles Willson Peale depicts his museum at the Old State House (The Long Room is shown in the background). ↑ ক খ গ ঘ Independence Hall (at "Independence Hall's History"). World Heritage Sites official webpage. World Heritage Committee. Retrieved 2010-03-16. ↑ Independence Hall. ushistory.org. 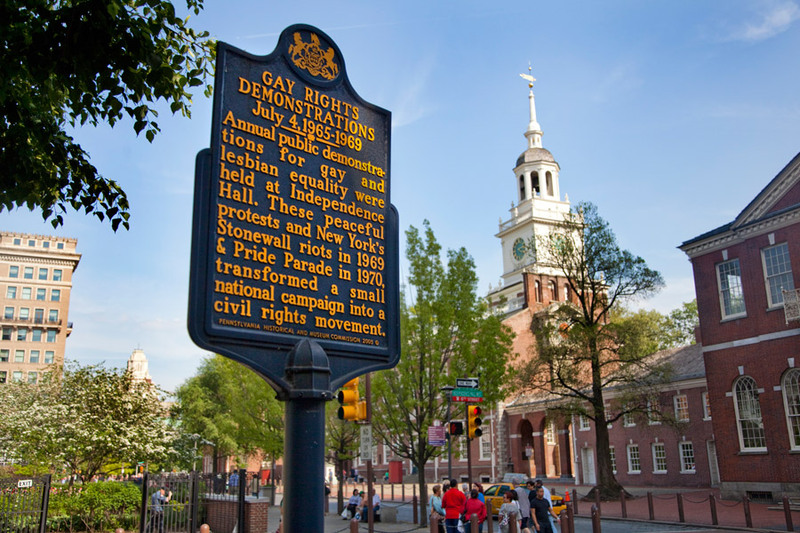 Independence Hall Association website. Retrieved 2010-03-16. ↑ ক খ গ ঘ ঙ The Nine Capitals of the United States. United States Senate Historical Office. Accessed June 9, 2005. Based on Fortenbaugh, Robert, The Nine Capitals of the United States, York, PA: Maple Press, 1948. See: List of capitals in the United States#Former national capitals. ↑ During this time period, American diplomats were negotiating the terms of peace with the Great Britain. See: Peace of Paris (1783)#Treaty with the United States of America. Based on preliminary articles made on November 30, 1782, and approved by the Congress of the Confederation on April 15, 1783, the Treaty of Paris was signed on September 3, 1783, and ratified by Congress on January 14, 1784, formally ending the American Revolutionary War between the Kingdom of Great Britain and the thirteen former colonies which on July 4, 1776, had formed the United States of America. ↑ National Freedom Day, from Encyclopedia of Greater Philadelphia. ↑ Bob Skiba, Gayborhood, from Encyclopedia of Greater Philadelphia.